I’ve been battling with a bit of anxiety lately along with the winter blues. Life gets overwhelming and I’m very sensitive. The girls are at a difficult age, my creativity is plummeting into darkness, my house is always a mess, I’m trying to push myself to be a better business woman; it’s a lot. I’ve found that meditating has been my saviour along with another mindfulness practice i’ve been doing on days that get really hard. Surrendering myself to the day, to the chaos, to the workload piling up while I am unable to do it. 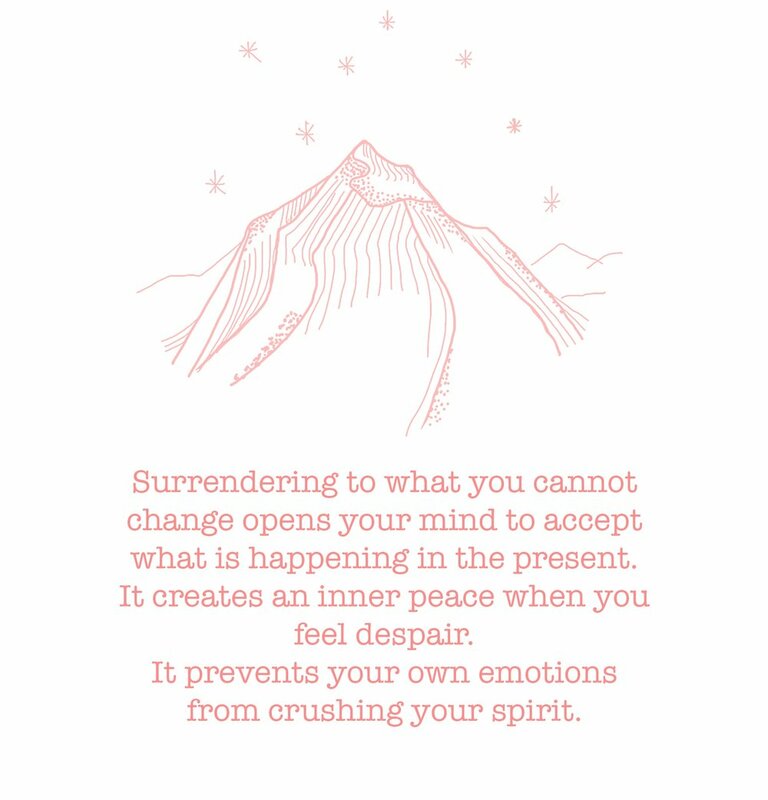 When I feel my emotions are getting really negative and they are preventing me from doing what I need to do, I surrender. Sometimes I want so badly to write or to take photos but my kids need me to be present and this makes me feel torn between the two and overwhelmed. Instead of letting this cause me unhealthy anxiety I just stop and say to myself “It is time to surrender to the things that I cannot control” and take a moment to accept the situation and let go of the guilt I feel for what I have to put aside. This isn’t giving up it’s quite the opposite. It’s opening yourself to accept what is happening in the present. It’s creating an inner peace when you feel despair. It’s preventing your own emotions from crushing your spirit. For example, the situation above, instead of getting mad at my kids for being extra needy and preventing me from working, I stop and accept the moment as it is. This is where I need to be right now, present with my kids, I cannot do both at present time and have no control over it right now; I surrender. I allow myself to accept my situation and my negative emotions instead of letting them become me. It gives me a feeling of peace where I would otherwise feel like I’m drowning. This has helped me so much and prevents me from breaking down completely. I’ve also found that it has made me a more productive person. Remember to always be kind to yourself and to take a moment to check in with your emotions. You’re doing the best that you can. 11 dresses to Scoop up for Spring/Summer.